Nothing says tense like escorting a small child around an island filled with rusty objects. 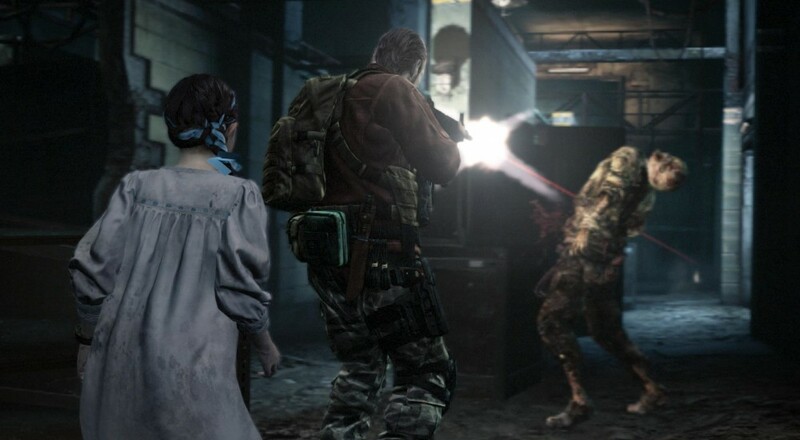 So, we know a bit about Resident Evil: Revelations 2 now. Through developer diaries and teaser trailers, specifics about the game have been drip-fed into our gaping maws, with the most recent morsel coming in the form of details about the raid mode. Today, we dive into the mechanics of the two player co-op campaign mode and get just a taste of the plot. We've got a couple Capcom UK folks showing off about eleven minutes of the beginning of Barry Burton and Natalia Korda's campaign. Capcom diligently removed all spoilers from this video, so your maiden voyage into the zombie infested world may be pure. Asymmetrical co-op is the name of the game here, as Resident Evil legend Barry Burton is much more capable in combat than the small child he's escorting. Natalia is not without her own merits, however, and as you probably saw in the video, she's perfectly capable of ruining a zombie's skull. Developers run the risk of creating sections where a character can feel useless if they specialize in separate areas. However, it can also be a rewarding experience if both players harmonize their various abilities to wreck a dangerous encounter. The "Drama Trailer" is up next. Resident Evil: Revelation 2 will see its first episode release on February 24th, with the other three episodes coming out on a weekly basis thereafter. All four episodes run for $5.99 apiece, though all episodes plus additional content can be snagged for a $24.99 season pass. Anyone who wants to wait and pick up all four at the same time can purchase the retail version on March 17th for $39.99. Patience does pay, though, as the retail version will contain additional bonus content not found in the episodic releases. Page created in 0.5543 seconds.